Objective: The primary objective of Bikes and Bibles, Inc. is charitable, specifically, to provide utilitarian bicycles and native-language Christian bibles to the poorest pastors and village leaders in Africa using the connections of the United Methodist Church (UMC) which is a major protestant denomination, to raise funds and to distribute the bicycles and bibles. 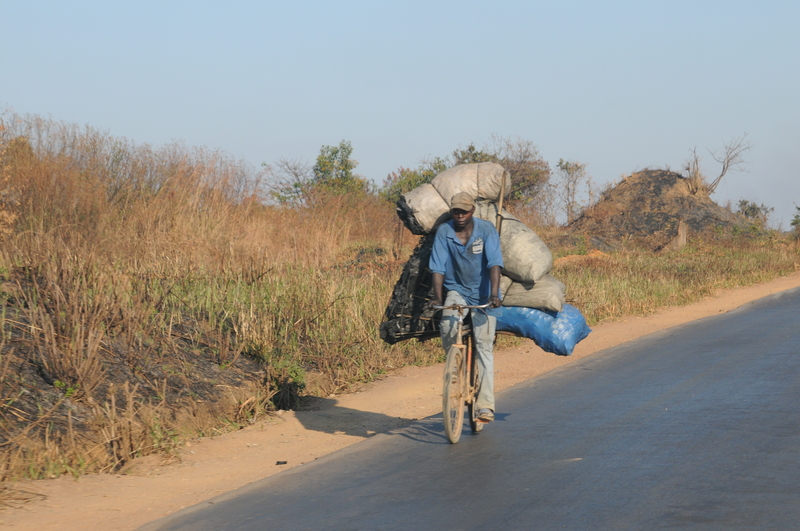 A Congolese pastor and his bike – looking good! 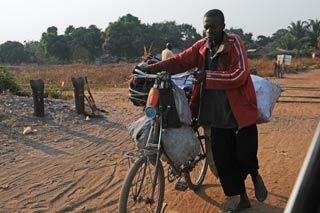 This is a Kinga 4×4 model bike, the workhorse bike in the Congo and the one provided by Bikes and Bibles. It weighs 50 pounds, all steel, single speed, and has a headlight. It also includes a platform for cargo and Mama! The “full” kickstand on the back wheel is best for soft or wet dirt. Reason: Pastors in local African villages often are without significant compensation from their congregations. They serve as local pastors, appointed by the United Methodist Church which is organized regionally as an Annual Conference. The pastors, who also serve as community leaders, often earn almost total support as local farmers or trades people within the village, town, or city. They rely on small farm plots or gardens to support their family while pastoring and serving as a community leader in a territory that spans several square miles. Transportation is often by foot. 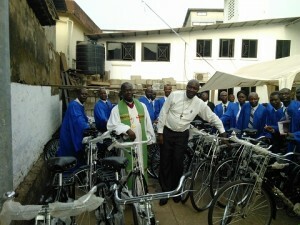 A bicycle is a vital tool for ministry and for commerce. Examples: A pastor put a sick woman on his bike and took her to a medical clinic several miles away. A pastor’s family harvests a crop, loads it onto their bicycle, and pushes it to a market place. 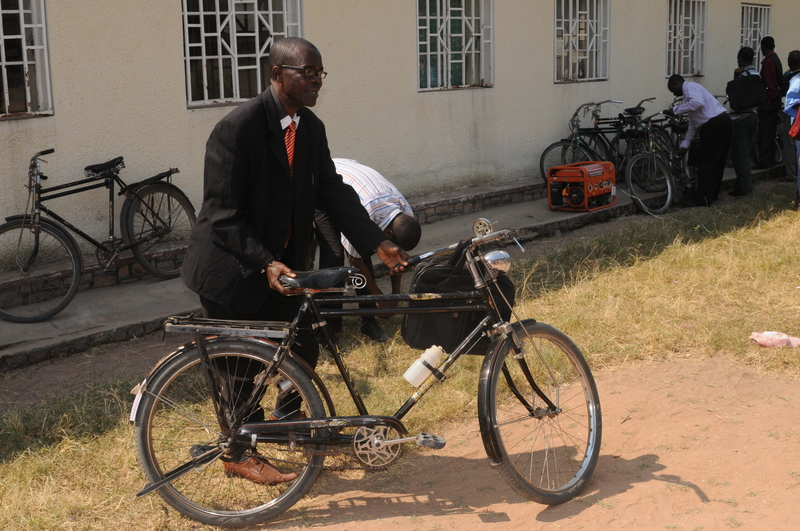 The pastor’s bicycle is frequently loaned to village members for such use. History: Bikes and Bibles, Inc. was incorporated 12/22/2015 as a Georgia, non-profit corporation, but it also operated in 2014 and 2015 as a component of the Kilpatrick Charitable Trust, a private foundation. The growth of this component and the future potential for additional growth indicated that it needed to be established as a separate entity and recognized as a public charity. Thus the separate incorporation. The initial 2014 funding of this work was $7,000 from Joe Kilpatrick for 40 bicycles and bibles distributed in the nation of Sierra Leone. In 2016 funding from public sources exceeded $80,000 with 300 bicycles and bibles distributed in seven African countries. Fundraising: Joe Kilpatrick makes telephone calls to people he has met through activities within the United Methodist Church. He asks for financial support for Bikes and Bibles. Joe invites pastors of congregations to solicit funds from individuals within their congregations and to support Bikes and Bibles through the general mission budget of the local congregation within the United Methodist Church, which is a major denomination with about 11,000,000 members in 8,000 local congregations. A schedule of contributors is attached which indicates that this is a publicly supported charity. Pedaling to market with a big load, but he’s riding, not walking. And Yes! That’s an ant hill in the background. Method of Distribution: The funds are sent into Africa; often to the office of a United Methodist Bishop, or sent directly to a retail supplier of bicycles or bibles followed by delivery to the Bishop. The bishop and his District Superintendents make the decision as to the final recipients, based on the location of the pastor’s local church (frequently rural,) and the pastor’s levels of need. The bicycles and bibles are then presented at a public meeting of all the pastors within the Bishop’s sphere of authority (the Annual Conference or a District Conference) The process for distribution is agreed to in writing via the use of emails. The receiving leaders in Africa respond with photographs of the presentations and videos and receipts for their purchase of bicycles and bibles. Bishop Yambasu, DS Charley, and local pastors in Sierra Leone. Website: There is a website for Bikes and Bibles, Inc. which demonstrates the publicity supporting the fundraising, and the results of the distributions. There are pictures and videos with testimonials about the distributions in various countries. www.bikesandbibles.org. The website adds public exposure, publicity and credibility, seeking public support. It is also a place where reports are made concerning the operating results of this charitable work. Displays at Public Events: Bikes and Bibles, Inc rented space at the public conferences sponsored by the components of the United Methodist Church. In 2014, Bikes and Bibles rented a space at a conference held in Athens, Georgia that was attended by over 2,000 members of the UMC. In 2016 a display space was rented in Portland, Oregon at a conference attended by over 5,000 members of the United Methodist church. Displays have been set-up at county-wide church events and in a local church. Photographs and videos are used to explain the operations of bikes and bibles, to generate publicity and request financial support. Accountability for the Bikes and Bibles bought and distributed: The announcements, presentations, and distribution of the bikes and bibles at the Annual Conferences of the UMC are public, visible events providing excellent transparency helping to ensure accountability, provide publicity for the program, plus demonstrating vital support and strong encouragement for the pastors in their preaching and community development work. The people of Bikes and Bibles: In the United States, Joe Wesley Kilpatrick, president, leads the work of Bikes and Bibles. Joe is a retired Certified Public Accountant, a life-time United Methodist with long service within the North Georgia Annual Conference, having served over 10 years as Conference President of UM Men and as a delegate to the UMC legislative conferences since 1988. Joe is a trustee at Asbury Theological Seminary, a former director of the United Methodist Publishing House, and a member of Tucker First UMC. Joe has traveled to Africa since 2006 and taught seminars on UM polity and financial accountability to UM leaders in many episcopal areas. He serves Bikes and Bibles as an uncompensated volunteer. Carole H. Kilpatrick, Joe’s wife, serves as the Secretary of Bikes and Bibles, Inc. as an uncompensated volunteer. Also in the United States, Rev. Rurel Ausley is a key advisor in this work. Rurel is lead pastor of Crosspoint UMC in Niceville, Florida, a member of the Alabama-West Florida Annual Conference. While playing a key role in the dynamic growth of this congregation to mega-church status, Rurel finds time to serve Asbury Theological Seminary on their Alumni Advisory Council. He is married to Lisa, an ordained Deacon, teacher, missionary and writer, who serves on the OMS Board of Directors. Rurel appreciates the key role Africa’s UM pastors and laity have played in the UMC denomination and so he travels to Africa annually to teach pastors and leaders in the North Katanga Episcopal Area within the Democratic Republic of the Congo (DRC) the practical ministry concepts developed by the International Leadership Institute (ILI). Africans in leadership roles: In the Southern portion of the Katanga Providence of the DRC, Rev. Dr. Kasap-Owan provided leadership to our work, before he was elected a Bishop in 2017. Kasap is well connected in the UMC Episcopal area as a member of a major chief’s family and as the president of Katanga Methodist University (the pioneer education mission station in the Congo) where he supervised pastoral training for the UMC. This has given him strong contact with the Bishop and a through working knowledge of the UMC in each annual conference. Kasap was elected by the UMC General Conference as the first African member of the UMCs University Senate, and has served as a member of the UMs General Board of Higher Education and Ministry. Also, Rev. Rukang Chikomb, a missionary and pilot employed by the UMCs General Board of Global Ministries, handles many of our logistical matters in buying and transporting the bicycles to the five annual conferences of the Southern Congo Episcopal Area, with operations extending into the African country of Zambia. Rev. Dr. Kimba Evariste is a director who provides leadership of Bikes and Bibles in the northern part of the Katanga Providence of the Congo (DRC) and in the African countries of Tanzania and Tanganyika. Kimba earned his D. Min degree at St Paul School of Theology in the USA. He has served as the assistant to the Bishop of North Katanga Episcopal Area, and currently is President of Kabongo Methodist University. Rev. Francis Charley is a UM District Superintendent, and Dean of the Bishop’s cabinet, in the African country of Sierra Leone. The Rev. Dr. Jerry Kulah was a UM District Superintendent in the African country of Liberia where he now serves as dean of the Gbarnga School of Theology for the United Methodist Church. Joe Kilpatrick, Carole Kilpatrick and Rev. Rurel Ausley, like all American officers and directors, serve as volunteers without compensation. Directors from Africa, Kasap-Owan, Rukang Chikomb, Kimba Evariste, Jerry Kulah and Francis Charley each received a fee of $1,500-$2,000 annually for their logistical and support services within Africa. Bikes and Bibles was begun financially when The North Georgia Annual Conference, Connectional Ministries provided an initial grant in 2014 of $3,750 covering start-up administrative costs (web-site development.) UMC congregations can make donations to the North Georgia Annual Conference of The United Methodist Church designated for Bikes and Bibles. That Conference forwards the funds to this entity for distribution in Africa as described above. Administrative costs in 2016 were $1,678 for web support services and for bank fees related to international wire transfers.